Quite possibly the biggest news this month (and almost certainly the most ambitious thing we’ve released since NAL is Alive at the start of last year) is the release of GameDevDan vs Life, a pack of 50 games from Dan’s 10 year career prior to forming Chequered Ink. It’s now available on Steam and Itch.io for just $5.99 and has received a pretty good reception so far! And then, YoYo Games added the pack to their Games Showcase! And sit tight, because Dan has also written a series of blog posts on the creation of GameDevDan vs Life which should be released soon. 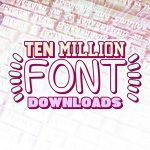 And in other HUGE news this month, our fonts reached 10,000,000 lifetime downloads across DaFont and Fontspace. To celebrate, we dropped the price of our commercial font licenses by up to 66% and put our font packs on sale on itch.io until this Friday, Don’t miss out! Earlier this month we updated our (constantly-evolving) font listing to make it easier than ever to search through our fonts by name, category and supported character sets. We’ve also released 38 brand new fonts for use in your projects! In fact, our list of new fonts takes up so much room we’ve decided to give you the option of skipping past them to read the rest of our round-up, click here to do that. 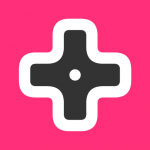 We don’t mention it here often, but we’ve been running a gaming blog called Truly Madly Dpad for over a year now. 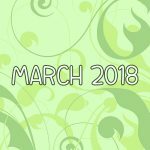 NAL has been relentlessly posting cheerful reviews of pretty much everything she’s played over the last few months, so be sure to head over there and check out our coverage! We’ve also performed a minor re-brand of the site giving it a brand new logo and even its own font. To keep up with news from TMD, follow us on Twitter and like us on Facebook. Finally, we’ve teamed up with an electoral reform group called Make Votes Matter, helping them to teach voters about the perils of gerrymandering with our game Districts. The game is also available on mobile devices and is a fun little puzzler even if you’re not interested in the political aspect. That’s all for this month. We’re working hard to bring you more fonts and (slowly) working on a couple of game projects in the background. Until next time, enjoy your sunny April!